The word honey comes from an ancient Hebrew word meaning "enchant." It's no wonder because honey is one of Nature's most wonderful gifts to us. It sweetens foods and beverages and provides us with healthful healing alternatives. Honey contains vitamins, minerals, and amino acids. 1 tablespoon contains: 0.1 g protein; 17.3 g carbohydrates; 1 mg calcium; 1 mg phosphorus; 11 mg potassium; 64 calories; 0 g fat. It also contains vitamin B6, thiamin, niacin, riboflavin, ascorbic acid, pantothenic acid, copper, magnesium, manganese, sodium, and zinc. Another important ingredient is antioxidants. Research on honey shows that it actually inhibits the growth of cancer. — Replenishes and enhances energy. Honey has energizing properties and can be used as a tonic. It is beneficial to people who have been weakened by illness or stress. It has been noted that taking honey less than 1 hour before a workout increases stamina (letting you last longer) and reduces the feeling of exhaustion. — Reduces stress. Honey can calm and relax the body and mind. — Helps promote restful sleep. — Helps relieve indigestion. The glucose and fructose in honey have been predigested, making them absorb easily into the intestinal walls and creating a soothing action. — Aids in treating cardiovascular diseases. — Helps treat respiratory conditions, such as asthma, bronchitis, and whooping cough, by soothing inflamed lungs and airways and possibly because it helps dissolve mucus. — Relieves allergy symptoms. Honey contains traces of pollen, and over time, it may desensitize one from allergens in the air. In order for this to work, however, experts stress using regional, unpasteurized honey to familiarize the body with local allergens. Studies have been done in which patients experienced relief from allergy symptoms after taking honey regularly. — Cleans teeth, mouth, and dentures, and stops bleeding gums. 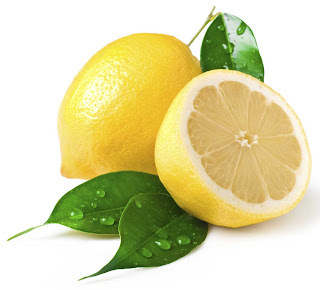 It is useful against canker sores, mouth ulcers, and mouth blisters. Honey can be applied topically to disinfect and heal wounds, scrapes, and burns. There are several advantages to it. The thickness of honey provides a protective barrier for the wound. It acts as an antibacterial, antifungal, and anti-inflammatory. The sugar in honey prevents a lot of water from getting to the offending microorganism, hindering its growth. At the same time, honey draws moisture from the air, promoting healing and helping to prevent scarring (I'm not sure how it does both). Honey contains hydrogen peroxide; as it slowly releases, it kills the germs. It promotes the growth of healthy tissue while reducing inflammation. It even makes wounds smell better by allowing the bacteria to eat its sugar; the bacteria then emits sweeter gases. Research in India found that people with burns who were treated topically with honey healed faster than those treated with silver sulfadiazine. They also experienced less pain and scarring and their wounds had less leakage. Research done in New Zealand at the University of Waikato indicates that honey is a powerful agent against several types of antibiotic-resistant bacteria, including those that cause flesh-eating diseases, gastric ulcers, and staph infections, as well as other "superbugs." Additionally, they found that honey killed certain bacteria that cause infections in burn units and in patients hooked to intravenous lines. Women, in particular, may benefit from regular doses of honey. Honey contains boron, which is good for the bones. Consequently, it is believed that honey helps prevent the onset of osteoporosis. The boron also raises the level of estrogen. This, in turn, reduces the symptoms of PMS. It is said that Cleopatra used honey to beautify her skin. She was right on the mark. The minerals, vitamins, and other ingredients in honey nourish the skin. — Its healing powers make honey ideal for chapped lips. 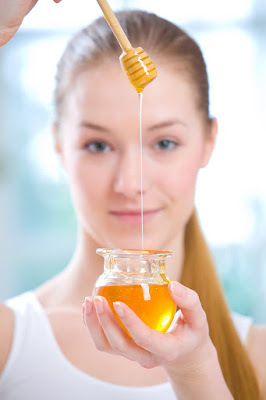 — Honey's antibacterial properties help with acne. A New Zealand study had teenagers treat half their faces with honey; they reported that their acne improved while the other half of their faces did not. — Honey conditions and shines hair. — Honey tones, cleanses, and moisturizes skin. The best quality of honey to use is "raw," which means that no heat was used to process it. Other words that indicate unprocessed honey are "uncooked" or "unfiltered." The effectiveness of honey, in terms of healing, depends on the quality you buy, since processed honey can have up to 50% less vitamin content than it had in its raw state. Other factors are the region of origin and the nectars that the bees chose to eat. These things change the ingredients of honey. In the U.S. alone, there are about 300 varieties of honey. Darker ones tend to have higher levels of minerals and antioxidants. They are also bolder in flavor; lighter varieties are milder. 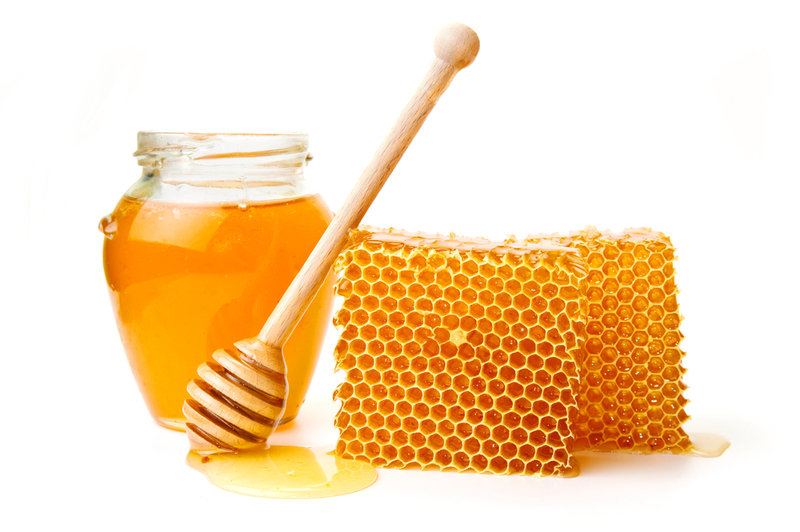 Honey comes in 3 basic forms: liquid, comb, and whipped (also known as creamed, spun, or granulated). Liquid means that the honey is removed from the comb through centrifugal force. Comb honey is removed with pieces of the comb. Whipped honey is made to be used as a spread. There are little environmental toxins in honey. Since bees die when they come into contact with pollutants, they can't bring anything back into the hive. However, some beekeepers use pesticides on their apiaries or feed their bees refined sugar. So try to find honey that has been organically produced. Store honey at room temperature. If it crystallizes, place the jar in warm water and stir. Or place it in the microwave for a minute, stirring occasionally. Be sure not to boil or burn it. Honey does not spoil and it keeps other foods fresh longer. — To heal a wound, spread honey directly on the wound and cover it with sterile bandage. — Apply directly to chapped lips and mouth sores. — For respiratory problems, mix 1 tablespoon honey with 1 teaspoon fresh thyme and take as needed. — For sore throats, stir some honey in tea or take a teaspoonful directly. — For skin problems, mix some honey with herbal or aromatherapy oil (such as lavender) and pour into a bath. WARNING: Never give honey to children under 1 year old. Infants are prone to getting botulism from honey. However, experts say that topical treatment for scrapes and burns is fine. Before sugar became widely available in the 16th century, people relied primarily on honey to sweeten their food, as well as using it as a healing aid. It is known that many of the great ancient civilizations used honey medicinally and people continued to do so until World War II, when antibiotic dressings were developed. Studies on honey continue all over the world. Australia and New Zealand have approved the sale of honey as medicine. As stubborn as they can sometimes be, even North American scientists are beginning to come back around to the ancient beliefs about honey. Honey is not a term of endearment for nothing. It's sweet and special. Below are some recipes and uses for honey, courtesy of http://www.honey.com, The Honey Experts. Combine all ingredients in a small saucepan and bring to a boil; cook 2 minutes. Toss with vegetables of choice such as: peas, zucchini, spinach, broccoli, green beans, etc. Serve over couscous as a vegetarian entree or alone as a side dish. 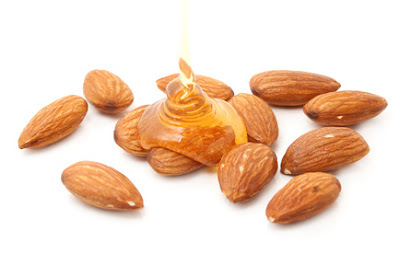 Mix 1 tablespoon honey with 2 tablespoons finely ground almonds and ½ teaspoon lemon juice. Rub gently onto face. Rinse off with warm water. Whisk together 1 tablespoon honey, 1 egg white, 1 teaspoon glycerin (available at drug and beauty stores) and enough flour to form a paste (approximately 1/4 cup). Smooth over face and throat. Leave on 10 minutes. Rinse off with warm water. Mix ½ cup honey and 1/4 cup olive oil. (Use 2 tablespoons oil for normal hair.) Work a small amount at a time through hair until coated. Cover hair with a shower cap; leave on 30 minutes. Remove shower cap; shampoo well and rinse. Dry as normal. In blender, puree 1 tablespoon honey with a peeled, cored apple. Smooth over face; leave on 15 minutes. Rinse with cool water. Mix 2 tablespoons honey with 2 teaspoons milk. Smooth over face and throat. Leave on 10 minutes. Rinse off with warm water. Mix 1 teaspoon honey with 1 teaspoon vegetable oil and 1/4 teaspoon lemon juice. Rub into hands, elbows, heels and anywhere that feels dry. Leave on 10 minutes. Rinse off with water. Add 1/4 cup honey to bath water for a fragrant, silky bath.